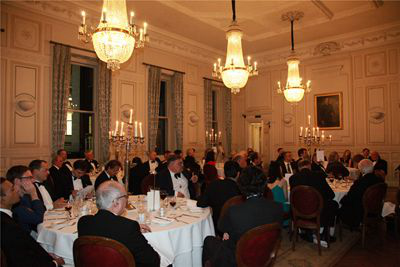 It is a real pleasure to join you tonight at this dinner of the 'Defence and Security Forum'. I appreciate this opportunity to share my views with you, whether you are from the financial sector or from the diplomatic corps in London. Sir John and Lady Maitland asked me to talk about China-UK relations, China's foreign policies and other topics of mutual interests. It seems to me there is no better time to talk about these subjects after the Brexit referendum in the UK and presidential election in the US. This reminds me of an often quoted saying: May we live in interesting times! As a matter of fact, I have been asked many times about the origin of this expression. Apparently, many of my British friends here seem to believe that this is a "mysterious Chinese curse". Some say Confucius once made such a comment. Others say it was Mencius who coined it. I and my colleagues at the Embassy have looked into the origin and but we can't find ANY equivalent of this expression from ANY Chinese historical documentations. Anyway, please don't take what I said today as an official announcement about the origin of this famous saying. This year, by any measure, is a year of many surprises. So regardless of the origin, I am sure you will agree with me that we are all indeed living in an "interesting time". Amid all the surprises and changes, we need to keep clam and get a grip on the prevailing trend. For China and the UK, the prevailing trend is the "Golden Era" of the bilateral relations. So, the main theme of my talk today is about the "Golden Era" for China-UK relations. How to understand this "Golden Era"? What does this "Golden Era" entail? What can we do to advance China-UK ties in this "Golden Era"? I would like to share with you my observations from four perspectives. The term "Golden Era" was coined by the British leadership in early 2015 and China responded positively. During President Xi's state visit, our two countries announced our shared commitment to building the China-UK global comprehensive strategic partnership for the 21st century. 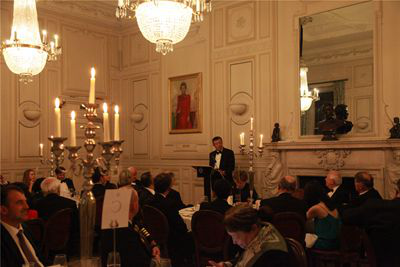 We confirmed that China and the UK will take our bilateral relations into a "Golden Era". After the Brexit Referendum in June, there had been media speculation about uncertainties in our relations. Some predicted that the, "Golden Era is losing its shine". Thanks to the concerted efforts and thorough preparations on both sides, Prime Minister May went to China in September for the G20 Hangzhou Summit. There, she and President Xi had a successful bilateral meeting. The two leaders reaffirmed the "Golden Era" of China-UK relations. They reiterated the shared commitment to building a global comprehensive strategic partnership at a higher level. Last week, China's Vice Premier Ma Kai was in London. 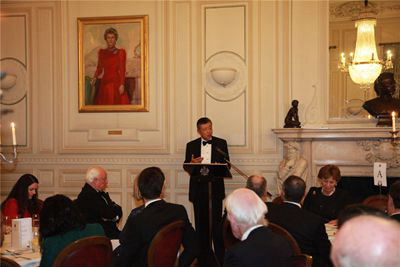 He and Chancellor Hammond co-chaired the eighth China-UK Economic and Financial Dialogue. In addition to reaching broad consensus in the Dialogue, the two sides clinched 63 cooperation outcomes. Earlier this year, our two countries co-hosted the First China-UK High Level Security Dialogue, the 12th meeting of the China-UK Joint Economic and Trade Commission, the First China-UK Regional Leaders Summit and the China-UK Leadership Forum. In the coming weeks, the China-UK Strategic Dialogue and the High Level People to People Dialogue are in the pipeline. Together these high-level dialogue mechanisms help build a platform for comprehensive communication and cooperation between China and the UK at all levels and across the board. They serve to consolidate the foundation of our relations, so that China-UK relations will continue to grow in the "Golden Era". The "Golden Era", as proved by all these positive developments, is certainly not a whimsical idea. The "Golden Era" is a strategic consensus between China and the UK. It is based on profound vision and insight. Building the "Golden Era" responds to the strong desire on both sides for closer exchanges and cooperation. Such strong, shared desire is the source of vitality of the "Golden Era". Second, the "Golden Era" is already bearing tangible "golden fruits". People from both countries are benefiting from the outcomes of our practical cooperation in all fields, from daily necessities to infrastructures, from businesses and financial services to scientific innovation. One notable "golden fruit" is the Hinkley Point C nuclear project that the British government approved not long ago. This project is the single biggest investment that China has ever made in the UK. It is in fact the biggest Chinese investment in the whole of Europe. This project will create more than 20,000 jobs and provide reliable energy supply to millions of British families. This project marks a new phase of China-UK win-win cooperation. Last year China-UK trade totaled 78.5 billion US dollars. China became Britain's second largest trading partner outside Europe. In 2014, the British government issued the first RMB sovereign bond in London. In 2015, China's central bank issued the first RMB denominated central bank bills in London. And in June this year, China's Ministry of Finance issued three-year RMB sovereign bond worth of three billion yuan, the first of its kind outside China, again in London. Nearly 160,000 Chinese students now study in the UK. Britain is the largest destination in Europe for overseas Chinese students. There are now 55 pairs of sister-cities between our two countries. More than one million Chinese and Britons travel back and forth every year. Not long ago, the aviation authorities of our two countries signed an MOU to increase flight capacity between China and Britain. This will certainly boost tourism and trade. This year also marks the 400th anniversary of the passing of Tang Xianzu and William Shakespeare, the two literary giants of China and Britain. Our two countries co-hosted a number of commemorative cultural exchange events. And the National Peking Opera Company put on stage in London two masterpieces of Tang. The General and the Prime Minister and the Legend of the White Snake were proved a great hit with the British audience. The "Belt and Road" is a major initiative of China to achieve all-round opening-up. It is an important public product aimed at promoting regional and global development. It will create opportunities for China and the UK to cooperate with third parties in finance, laws, education, culture, etc. And there have already been much discussion and planning between people from all sectors of our two countries over the ways and means of possible cooperation with the "Belt and Road" framework. I am confident that, as our bilateral relations continue to grow, there will be more substantial and tangible "golden fruits". And these "golden fruits" will not only benefit people of our two countries but also people around the world. China and Britain are both countries of global influence. However, when the UK voted to leave the EU, there were worries about an inward looking trend. After Prime Minister May took office, she reiterated her government's unchanged commitment to Britain's role as an "outward looking nation" and an active player in world affairs. And Britain's continued global involvement will create more opportunities for China-UK cooperation on global and regional agenda. Both China and the UK are members of the UN Security Council. Both are responsible for the international system and global affairs. For decades, our two countries have maintained close communication and cooperation at the UN Security Council, G20 and other important international organizations. Britain has clearly demonstrated its strategic insight and courage to take the lead in international cooperation. It was the first major western country to join the Asia Infrastructure and Investment Bank. China and the UK are also in the forefront in the response to global health challenges by strengthening cooperation on antimicrobial resistance. The dialogue was an opportunity for in-depth exchange of views over fighting against terrorism, cybercrime, organized crime and other international and regional security issues of common concerns. And our two countries agreed to strengthen bilateral security cooperation based on equality, mutual trust, sincerity and pragmatism. It is obvious that China-UK relationship goes far beyond the bilateral scope. Our ties are showing great potential to lead regional and world development. In the "Golden Era", this global dimension of our bilateral relations will continue to unfold. Fourth, the "Golden Era" needs constant care and innovation from both our countries. China and the UK are different in social system. We are in different stages of development. We have different culture and traditions. It is inevitable, and only normal, that our two countries have different views and sometimes problems between us. The unveiling of the "Golden Era" does not mean that the differences and problems will automatically disappear. But the "Golden Era" requires us to approach whatever differences and problems we may have in a proper way. And the "Golden Era" will last as long as we manage our differences well and deal with our problems appropriately. We need more mutual respect. We need deeper mutual understanding. We need stronger mutual trust. And we need closer mutual exchanges. Lessons from the history of the China-UK relationship tell us that equality and mutual respect are not empty talk. They are highly relevant. Our two countries should respect each other's social system and path of development. We also need to respect each other's value and cultural traditions. And in particular we have to respect each other's core interests and major concerns. Let me take issue of Tibet for an example. Tibet is a sensitive issue for China-UK relations because the question of Tibet bears on China's core interests and national sentiment. Tibet has been part of China since ancient times. But in recent history, it was made into an issue and used by some in the West, including Britain, in attempts to split China. To this day, some British politicians are still backing the separatist forces. Such an approach is clearly in violation of the principle of mutual respect. It will not give positive impetus to the "Golden Era" of China-UK relations. Memories of the attacks on China in recent centuries and the dismemberment of the Chinese nation have influenced China to be most firmly resolved to pursue national unification. In turn, China will not do anything that undermines Britain's sovereignty and territorial integrity. But, we hope Britain will better appreciate how important national unity is to a country's stability and prosperity. I hope Britain will exercise prudence on the question of Tibet and truly respect China's core interests and major concerns. This issue had been one major barrier to the development of China-UK relations. But our two countries successfully solved the question of Hong Kong left over from history through negotiation. The past two decades since Hong Kong's return to China in 1997 witnessed Hong Kong maintaining stability and prosperity. And the success of "one country two systems", "Hong Kong people administering Hong Kong" and Hong Kong enjoying a high degree of autonomy has been widely recognized. "The tree craves calm but the wind will not abate". These words reflect how a few people in Hong Kong choose to pay disregard to China's constitution and Hong Kong's Basic Law and other laws. They choose to damage the rule of law and social stability of Hong Kong and to challenge China's national sovereignty and dignity. Some went as far as openly call for "Hong Kong independence" or "Hong Kong self-determination". In addition these people chose to display insulting pro-independence banners at the swearing-in ceremony of Hong Kong's Legislative Council. On 7th November, the Standing Committee of China's National People's Congress made an interpretation of Article 104 of the Basic Law. This article governs the swearing-in of members of the Legislative Council. The interpretation upholds the sanctity of the Constitution and the Basic Law and protects China's sovereignty, security and development interests. And this is to safeguard "one country two systems" and the long-term stability and prosperity of Hong Kong. Yesterday, the Hong Kong High Court ruled to disqualify the two members-elect who called for "Hong Kong independence". After Hong Kong's return to China's sovereignty, its affairs have been China's internal affairs and no other country has any reason to interfere. Britain needs to exercise prudence and abide by its commitment of not supporting "Hong Kong independence", or offering support to secessionists and extremists. Britain should join hands with China to use Hong Kong as a bridge for closer exchanges and cooperation between our two countries. And we should work together to turn Hong Kong into a positive factor in the "Golden Era" of our relations. We should stand in each other's shoes when it comes to differences between us. We should take an objective and comprehensive approach to each other's progress. If one failed to do so and dictated to the other, this will only give rise to antipathy and misunderstanding. And this will keep us away from achieving mutual learning and common progress. The changes in China in the past three decades have been unprecedented in human history. The 30 years of reform and opening-up in China have brought about tremendous changes with industrialization at a scale and speed never seen before anywhere in the world. A major outcome is that over 700 million Chinese have been lifted out of poverty. Seeing is believing. Anyone from Britain who has visited China will find it a place full of vigor and vitality. However, no one is perfect. Both China and the UK are working hard to protect the rights of their citizens in the face of tremendous social and economic changes. It means both China and UK are constantly striving to improve. Most foreign visitors just see Shanghai, Tianjin, Guangzhou and many other cities on China's eastern coast. These urban areas do not represent the complete picture. In the western province of Gansu, where I used to work, and in many other inland provinces, life is still very poor. And some places are even suffering from severe shortages of drinking water. China still has to work long and hard to give each and every one of its 1.3 billion people a better life. So I hope that the British public will recognize China's remarkable progress, but, at the same time, appreciating the basic fact that China remains the world's largest developing nation. Based on mutual understanding, we can build mutual trust. China and the UK need to keep our minds open and strengthen mutual trust. "If we treated China as an enemy, we were guaranteed a future enemy. If we treated China as a friend, we kept open the possibility of a more peaceful future." China and the UK are partners for cooperation. This relationship is not a rivalry. We are not potential threats to each other. And when looking at China-UK relations, one should live in the 21st century body and soul, rather than leaving one's head in the 20th or even the 19th century. A Chinese wave power company was accused by the British media of stealing technology from a British company. The reason for the accusation was this: Years ago the British company was broken in two months after a visit by a Chinese delegation. Without any evidence, the unsolved burglary is oddly associated with a Chinese company who recently unveiled its wave power device. If visits and exchanges between Chinese and British businesses are suspected of commercial technology theft, how could the two sides ever engage in win-win cooperation? And such groundless suspicion will only undermine mutual trust and do no good to China-UK relations. 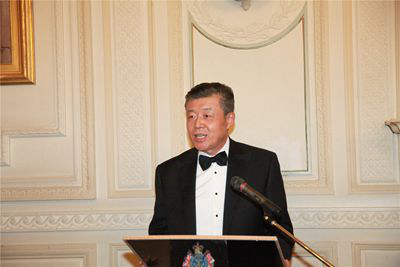 I have had the privilege of being Chinese Ambassador in Britain for nearly seven years. I have observed tremendous efforts by many British and Chinese people to build deeper understanding between our nations. However, I find our two countries still in great need of stronger mutual trust. This means much more work is needed to build up such mutual trust. But how to deliver? The answer lies in closer mutual exchanges. The amity between states depends on the friendship between peoples. People-to-people exchanges between China and the UK have always been an important powerhouse for our relations. And they are the soil in which mutual trust grows. In recent years, there has been a boom in China-UK people-to-people exchanges. In China, more than 300 million people are learning English. Hundreds of millions are fans of the Premier League and British TV shows. Here in the UK, there are more Confucius Institutes and Classrooms than in any other European country. And more than 600 primary and middle schools have started to teach Chinese. For example, there are far more Chinese students in Britain than British students in China. Some of my British friends reminded me that I should put this in the per capita context. Even so, the gap remains. China's population is 20 times the British population, but the number of Chinese students here is 30 times bigger than the number of British students in China. The Chinese public know about Britain far better than the British public know about China. This is partly due to unbalanced media coverage. In China, most of the reports about Britain are positive. Here in the UK, we read more bad than good news about China. British people visiting China often find a very different country from what they have read about in the British media. And this is perhaps something the British media needs to pay attention to and reflect on. We must use all effective resources, channels and platforms to expand mutual exchanges and consolidate the public support for China-UK relations. And we also need to focus on increasing exchanges between our young generations. It is the young people who will shape the future of our relations and carry forward our friendship. The current sound relationship between China and the UK has not come by easily. Both countries are obliged to ensure the continued growth of the relationship, not only in this opening year of the "Golden Era", but for many years to come. And China-UK relationship should be a good example of relations between countries with different social systems. History always reminds us of important lessons at certain crucial point. 2017 will mark the 45th anniversary of the establishment of Ambassadorial diplomatic relations between China and the UK. The past four decades and more have been an extraordinary journey for China-UK relationship. And looking into the future, both China and the UK need perseverance and enterprise to ensure a steady and enduring "Golden Era". "This great age enables our two countries to join hands and move forward from the new departure point of our comprehensive strategic partnership." We should keep to the direction of building a "Golden Era". We must advance our bilateral cooperation in all fields. I hope to continue to have your understanding, care and support for China's development and progress. I look forward to working with you for a more promising future of China-UK relationship. Now, I am ready to take your questions.